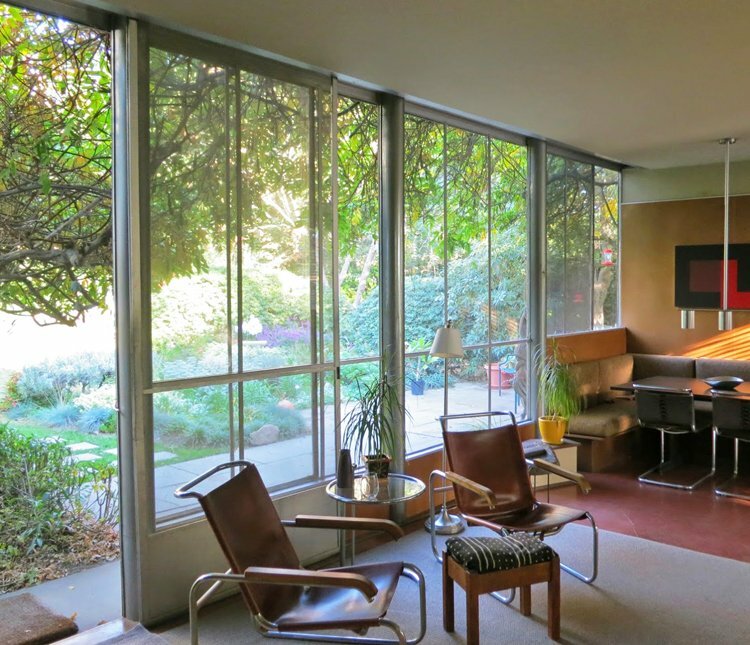 Neutra's Beard house (1935 - top), early example of top-hung sliding door and rollers (above). 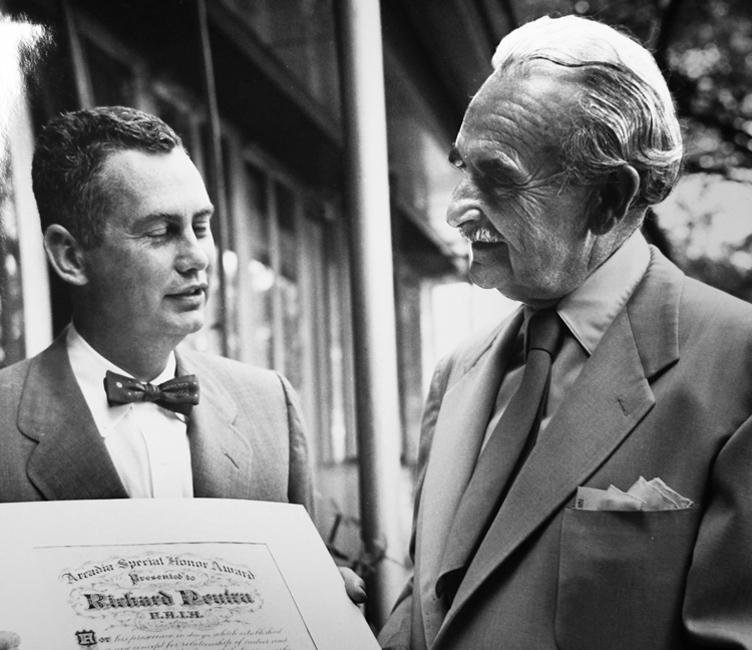 Richard Neutra receives an award from Arcadia, circa 1960. That same year, the firm Acme promoted its sliding door hardware, its wheels of natural rubber with a nickel-plated steel ball bearing wrapped around a graphite core, promising "rubber wheels that promote smooth, silent operation, free from all squeaks and rattles." Dion Neutra recalls, "During the '50s we were specifying Steelbilt [steel doors], a door that still functions in my house today, at 65 years. 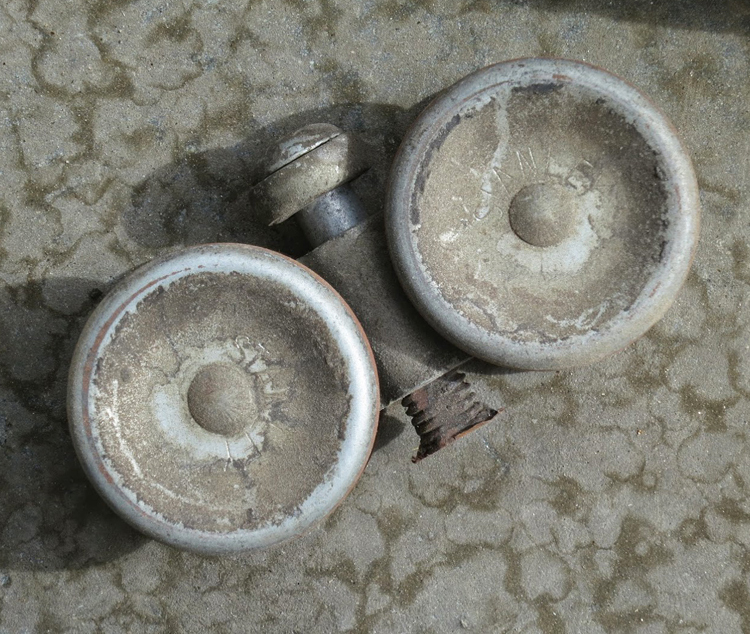 They used bronze rollers, which have still performed without lubrication for all this time." After the top roller, the advent of aluminum proved decisive in turning sliding doors into mass-marketable goods. Aluminum, until the 1940s used on buildings primarily as trim, came into increased use in the late 1940s thanks to technical developments spurred by World War II. Aluminum was alloyed with other metals for greater strength, and extruded into desired shapes. After the war, the government encouraged the use of aluminum in domestic goods because it wanted to maintain high industrial capacity of aluminum for use in future wars. 'We're Rootin' for Aluminum Windows,' an Alcoa ad promised in 1941, showing window frames in a college dorm room that sparkled as though painted with silver leaf. An Alcoa ad five years later bragged of architectural uses for the material—entire house façades, bank grilles, skylights, revolving doors, windows, Venetian blinds. But no sliders. But by 1953, aluminum sliders had arrived. Ads for manufactured sliders, which had never before been seen, began popping up in the architectural magazines, often several per issue. "[Aluminum] was more affordable than steel because it was an extrudable product," says Neal Anderson of Arcadia, who says Arcadia was the first to produce such doors, and compares the process of extrusion to shoving Play-Doh through forms to produce desired shapes.